Rio Grande Elementary students, members of the Gallia Health Department, STAND and Rio Grande Mayor Matt Easter stand at the Memorial Park playground in Rio Grande. RIO GRANDE — Rio Grande Memorial Park playground was declared a smoke-free zone Thursday during a brief gathering of Gallia Health Department officials and Rio Grande Mayor Matt Easter. Conley has previously appeared before other municipal bodies in the county in hopes of promoting tobacco smoke prevention. 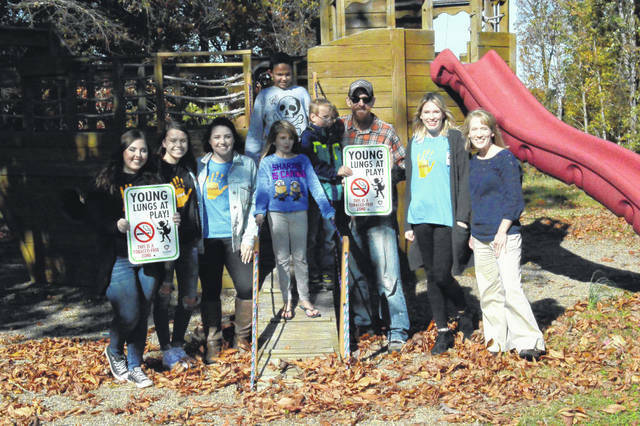 The goal of the Young Lungs at Play policy, according to Conley, is to keep the playground area clean and free of cigarette litter while also protecting children from the dangers of secondhand smoke. The initiative is funded by a grant utilized by the health department. Signs will be placed around the playground of Memorial Park similarly to no trespassing signs, according to Easter. Easter specified that just the playground area of Memorial Park would be smoke free.